2) I know Jamey loves me and is attracted to me (sometimes I do wonder why) and that is enough. Where in the WORLD am I going with all this you are wondering. Well, here's what happened. In the past month, I have had two individuals express interest in me. This NEVER happens. At least, it hasn't happened to me in a very, very, very long time. I mean, I am usually in old shorts and a tomato-stained t-shirt. I go nowhere, except our local grocery store which is frequented mostly by mothers and their children and retired people. The only men I come in contact with (other than my dear husband) are neighbors and fellow church-goers who are married and certainly know I am married. And, after two babies, I have a lots of...let's say...extra epidermis. I wish there was a program for this, like Locks of Love, where I could make a donation to the epidermis-ly challenged. This first incident needs to be taken with a grain of salt, I know. I have been working, very part-time, for a caterer, about an evening a month. I serve, clear tables, etc. 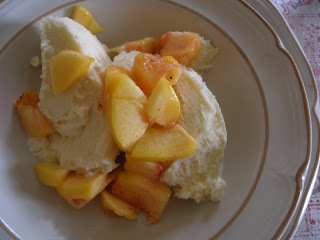 One evening, very late at night (I think it was around midnight), a man about my age, who was clearly intoxicated made some reference to my backside resembling a certain fruit that comes in the fall. That you make sauce with. It grows on a tree. This is as PG-13 as I get, don't worry. He was trying to hit on me. I say trying, because after making a comment about the only place he's going to find that type of fruit, I walked away and stayed away. At least for me, being a stay-at-home mom can feel, at times, like I live in another world. A very small world. A very sheltered one. I like it here very much. It should be (and actually is) enough to know that I'm attractive to the one that matters most (dear husband). I know it is natural and normal to feel flattered when someone compliments you. We all like it. It makes us feel good even when we KNOW that it's what's on the inside that matters. That's what we tell our kids, right? And, for those of you who tune in for pictures of food, I don't want to disappoint. 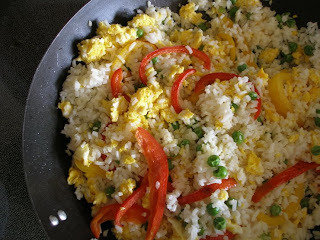 Here is what we had for dinner: egg fried rice with peppers from Mama JJ and Jamey's homemade ice cream with peaches. you think of funny things when you mow! :) but i totally agree. it's nice to feel attractive! and be told about it too!! Gen, I love you, you beautiful lady, you! Right back at ya, Mama JJ!! !